Product prices and availability are accurate as of 2019-04-22 15:04:12 UTC and are subject to change. Any price and availability information displayed on http://www.amazon.com/ at the time of purchase will apply to the purchase of this product. 18kt rose gold case with a black leather strap. Fixed 18kt rose gold bezel set with 60 diamonds. Silver dial with blue hands and Arabic numeral hour markers. Minute markers around an inner ring. Dial Type: Analog. Automatic movement with a 42 hour power reserve. Scratch resistant sapphire crystal. Pull / push crown. Skeleton case back. Case diameter: 29 mm. Case thickness: 8.8 mm. Round case shape. 18kt rose gold tang clasp. Water resistant at 50 meters / 165 feet. Functions: hour, minute, second. Luxury watch style. Watch label: Swiss Made. 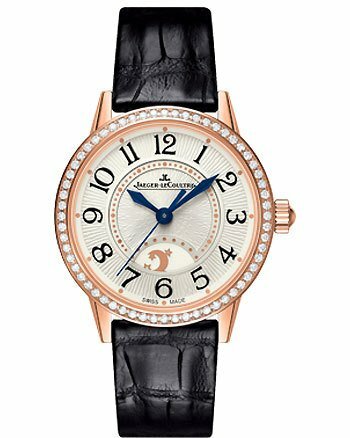 Jaeger LeCoultre Rendez-Vous Silver Dial 18kt Rose Gold Black Leather Ladies Watch Q3462521.